Genuine clear and Multi Color cubic zirconias sparkle in the silvertone setting of this Tennis Bracelet. These are NOT crystals or glass. They are top quality CZ stones. Tongue and Groove with double clasp closure. Durable Rhodium White Gold Plated(Rhodium). Bracelet measures your choice of 7", 7 1/2" or 8" in length and just under 1/2" wide. 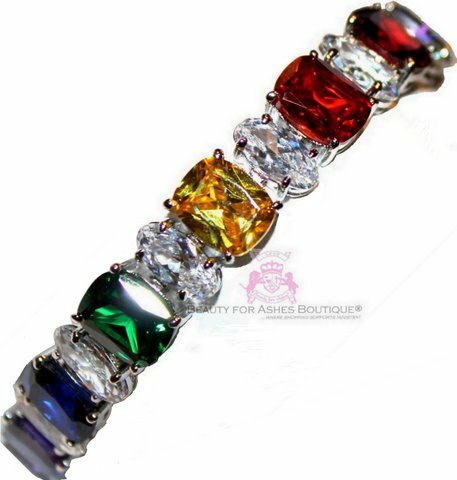 Super quality CZ's in Merlot, Fire Orange, Medium Canary, Peridot(only on 7.5" or 8" bracelets), Emerald Green, Sapphire Blue and Amethyst! We carry several items in multi color - either rainbow in the sky or God's Promise Rainbow items that will match this item.. just type in Rainbow in the search box in our store.